If you’ve taken a look at our posts on the benefits of document scanning, you should be clued up on why we think our services are a positive thing. But let’s take a deeper look at one of those benefits and what it could mean for your company. If your filing cabinets previously took up a room of their own, scanning your documents and disposing of the original documents could have left you with a perfect size space to rent out. This is a great solution if you feel you already have enough space within the building. Not only will you be able to utilise that empty space but you will also be generating some extra income in the process. If you have been looking to buy some new technology or resources but didn’t have anywhere to put it, this new-found space could be just the solution. Maybe one of the offices needs a printer upgrade but the new printer takes up more space or the office is cold and needs radiators fitting. Replacing filing cabinets with something more useful or aesthetically pleasing will be a positive step for your company. At the end of the day, once you have cleared the space, the opportunities are endless. Regardless of what you decide to do, just having more open space in the office will boost staff morale which will then improve efficiency. As we know, a happy workforce is a helpful workforce. 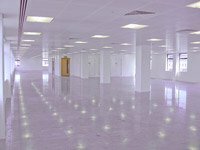 If you would like to know more about the benefits and how they can help you claim back much needed office space then please take a look at our blogs or give us a call to speak to one of our friendly team.